Anyway, moving right along. Gemma gave us a bunch of questions to answer and the idea is to give you a tour of our space. But this tour has started some interesting conversations with my WSBN friends about our rooms and our habits and behaviors and our feelings about sharing photographic evidence of them have got me thinking, so I thought that as well as sharing my space, I’d share some of my thoughts. Feel free to just look at the pictures though, if that’s what you’re here for! (Oh, and sorry for the poor pictures, I didn’t realise how out of focus I was until tonight and if I take another set I’ll be even later posting this! chair (the office one) tucked away under the table). I wheel it out for her to sit on when she wants to hang out with me down here. So, what’s the thinking part? Well, I’ve been thinking about the relationships between habits and behaviours, and how the space that you work in affects your creativity and your productivity. 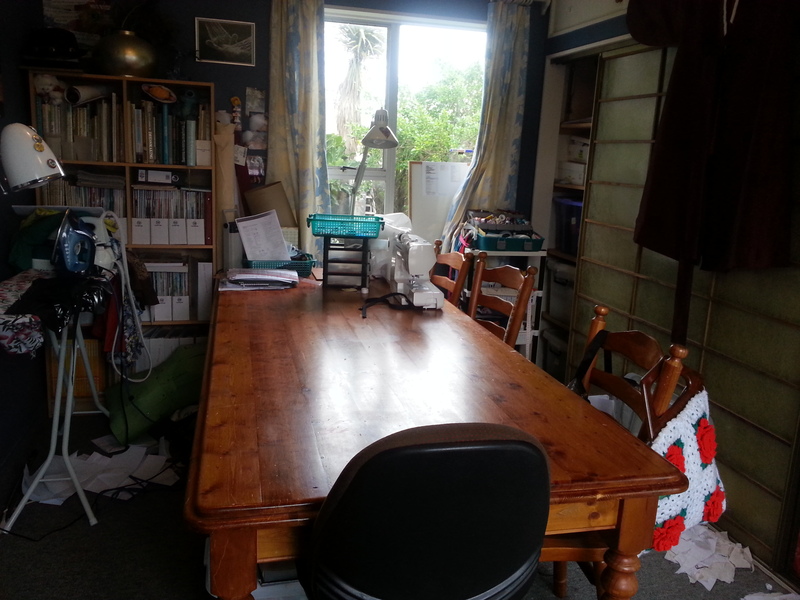 We’ve had lots of chats in the WSBN since we started this series about the messiness, or lack thereof, of our sewing spaces. 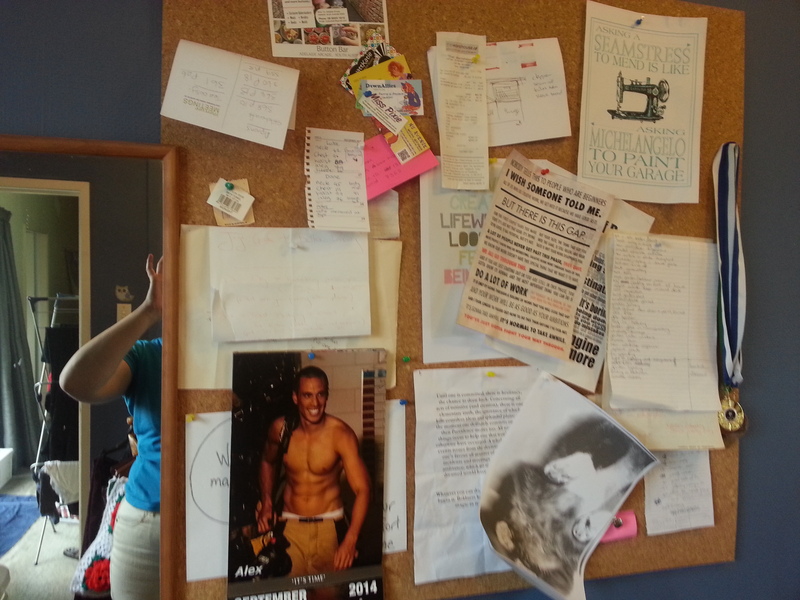 Many of us declared our spaces to be a mess, and decided to show our spaces, mess and all, on the tour. I find it such a refreshing change to all the Pinterest-worthy media we often consume through blogs and magazines to know that mess is human, and often part of the creative condition. 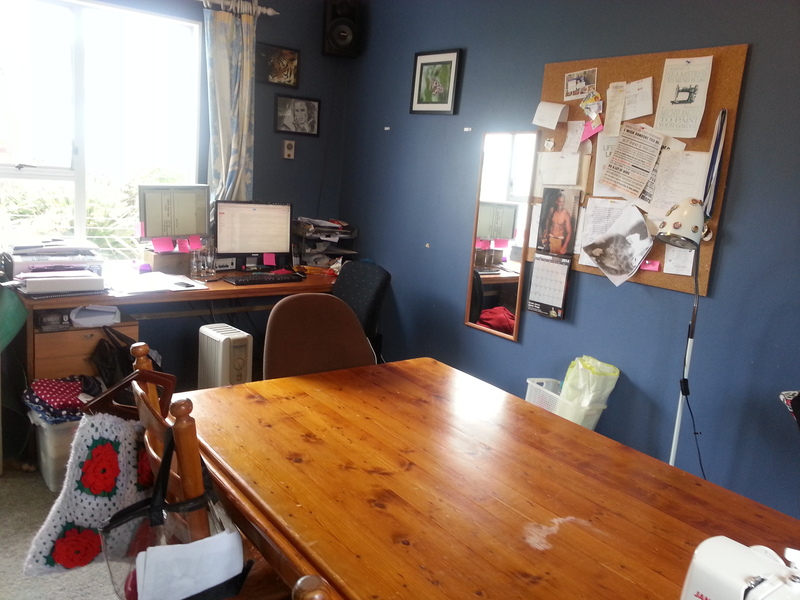 In fact, recently I read several articles that suggest people working in messy spaces are more creative! But for me, if there are mountains of mess towering over me while I sew or craft I feel their presence as an oppressive force. I struggle to start a new project if there is a mess on the table and have to tidy up first, else it acts as a constant distraction. I’m not exactly a neat creator though, so during a project a mess of offcuts, misplaced objects, pattern tissue, and bits of mock up and fashion fabrics will end up smeared over all my working surfaces. But if the ripples of chaos spread out too far, that oppression will again weigh down on me until I snap and do a mid project tidy up while childhood mantras about “clean as you go” go through my head. As the room does double duty as craft room and home office, my sole work table is also the central sorting and clearing house. This is where bills to be paid and letters to write and broken things to fix and receipts to file and to-do lists and other seemingly endless accoutrements of being a grown up collect. A friend refers to these piles as “kipple”, which I love! I’d rather have my kipple accumulate somewhere other than my work table, but for assorted reasons my is where it gathers. So I find that the mess in my sewing room is tidal. Bits will accumulate like seaweed pushed up to the high tide mark, making drifts that show the currents I make as I move around my house. When I want to sew or craft that need for tidiness means I sweep through and drag it under control, tidying the piles (and often relocating them onto the bed), only for the very next wave to push more unopened mail up into a corner. These photos were taken at a particularly low tide, as immediately after taking these photos I had a guest over and launched into a new project, both of which meant I needed to clear the table. Same side as the door, looking back the other way. The light coming through the windows made this shot hard to get! With my back to the desk. The door is to my right, and other than the door the entire right hand wall is two double wardrobes with sliding doors. Minerva’s chair is in front of me. At the very back of the table, by the bookshelf, is a small pile of kipple. 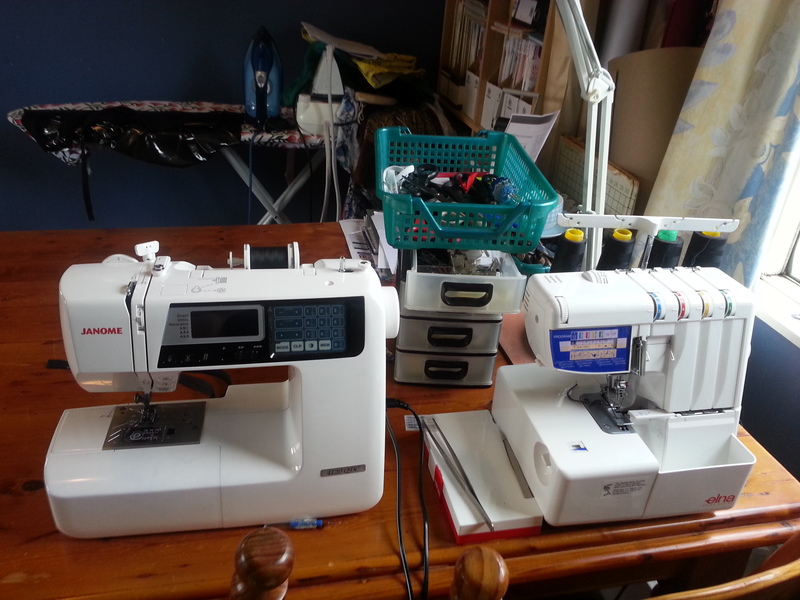 My sewing machines, tucked into a corner of my work table. Behind is a small set of drawers and a tray that contain scissors, quick unpick, pins, and all the other rapid-access stuff. 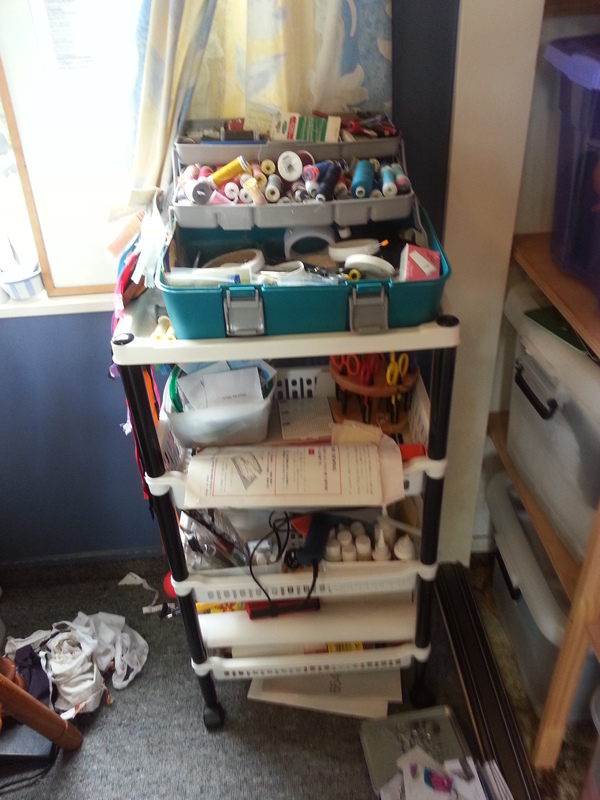 Immediately to my right when I’m sitting at my machines is this tower The tackle box on the top is filled with thread and elastic and saftey pins and my rotary cutter and other stuff that I want to be able to find quickly but aren’t used every project. Zips hang off the side. The other levels are other tools and equipment, including glue guns, lots of different types of glue, paper scissors, etc. My sewing machine manuals also live in this. My home-made corkboard (made from a pack of cork tiles and a couple of corrguated cardboard boxes). Was meant to be a beautiful moodboard, is more of a dumping ground. Yes, that is a photocopy of my cat, she sat on the printer when it was open so I pressed the copy button! And yes, that is a copy of the NZ Fire Fighter’s calendar – men’s version. It’s signed by Mr April. There are also my dance medals and some of my favourite quotes, amongst the debris. The double wardrobes and their sliding doors. 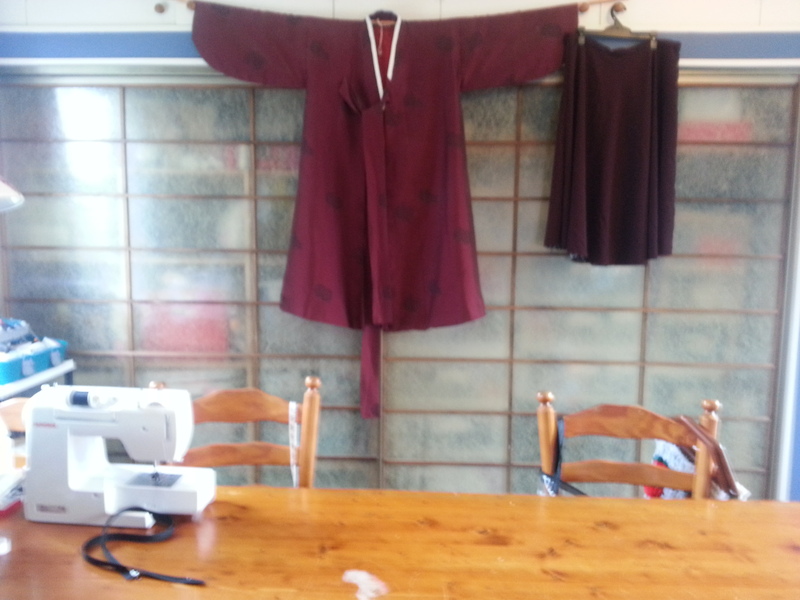 The kimono was a gift from a previous flatmate, and the skirt is waiting to be levelled and hemmed. The left hand double wardrobe, right behind my machines. 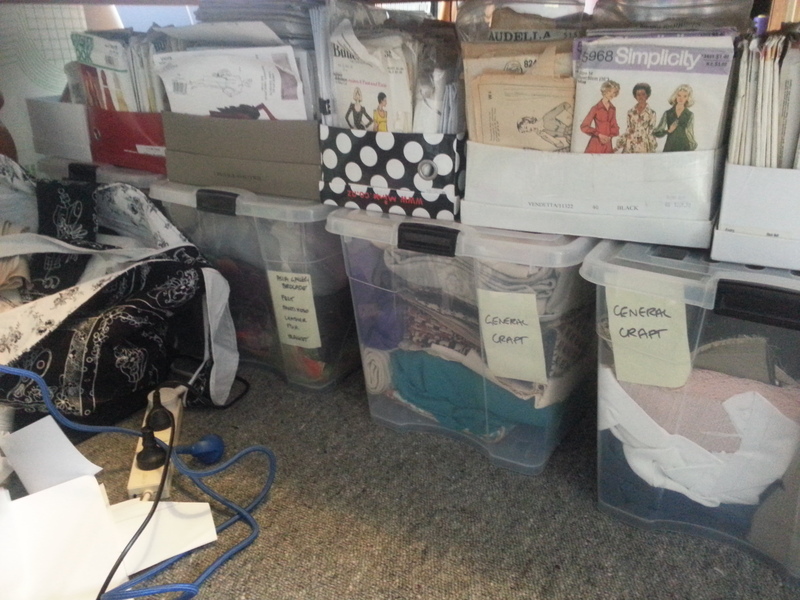 This is almost all sewing or costuming related. The shelves are custom built to support the clear bins, which are all fabric. I have an enormous stash, to the point it makes me uncomfortable sometimes. The red bin is all ribbon and trim. The second from top shelf is largely filled with shoeboxes, all labeled, one for interfacing, one for hardware (buckles and boning and bag handles), one for costuming bases (untrimmed bras and gloves), one full of flowers for costuming, one for sew on motifs and patches, and more. A few are obscured by the corner of the kimono. There is a little set of plastic drawers, like the one on my sewing table, tucked away in there for buttons. The top shelf has WIPs, both sewing and other crafts. Attempting a close up of the sewing wardrobe. 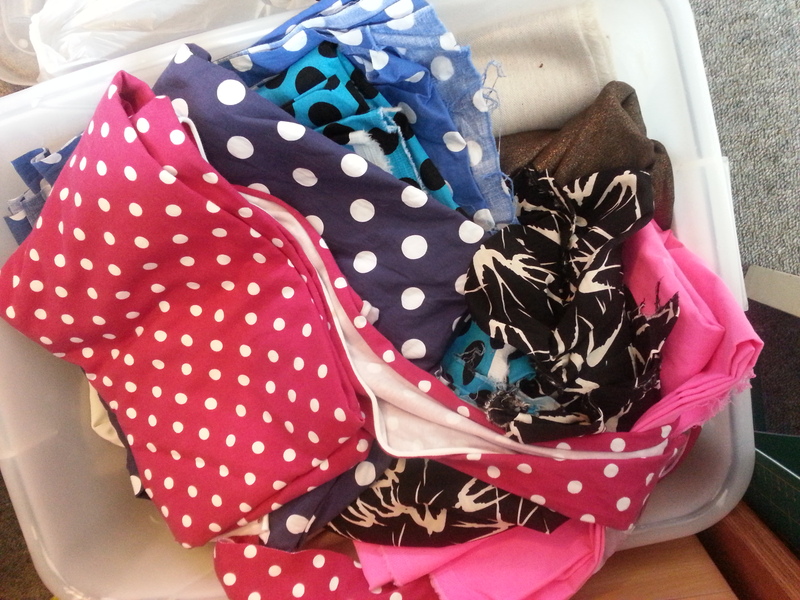 Some of my fabric goodies, stashed away in a bin. I tie all my fabric into rolls, it makes it 1000 times easier to dig through and tip them out and pet them. 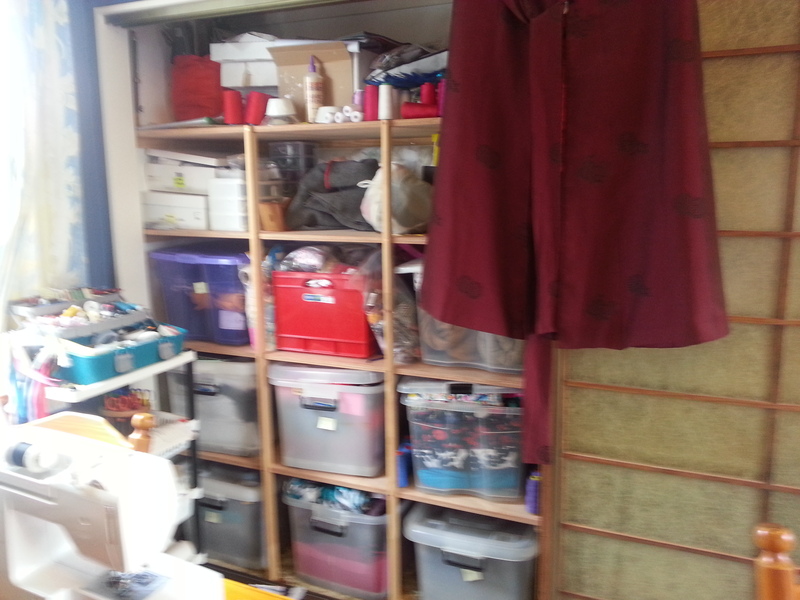 The other corner, opposite from the sewing cupboard. 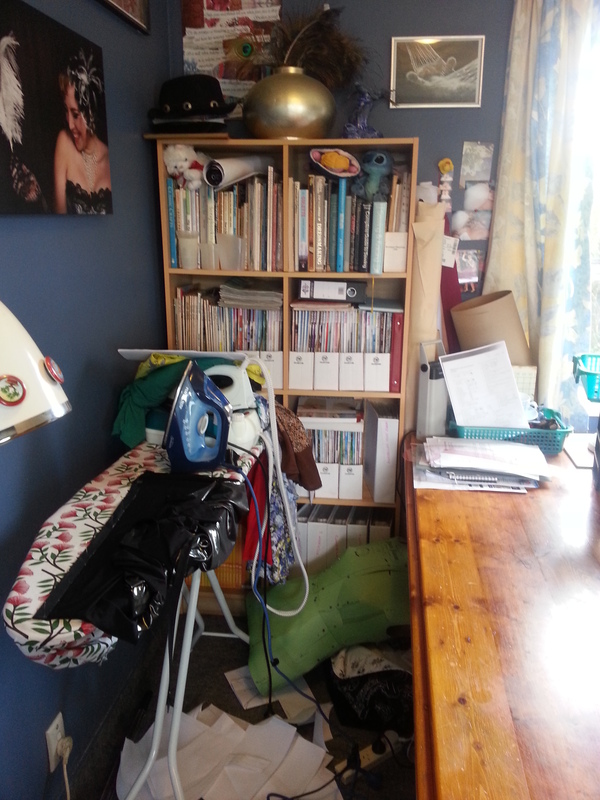 My shelves, filled with sewing and crafting books, knitting magazines, and Burda magazines; and my ironing board, currently drowning in undone ironing. Pressing in a project, yes. Ironing my washing, very infrequently. 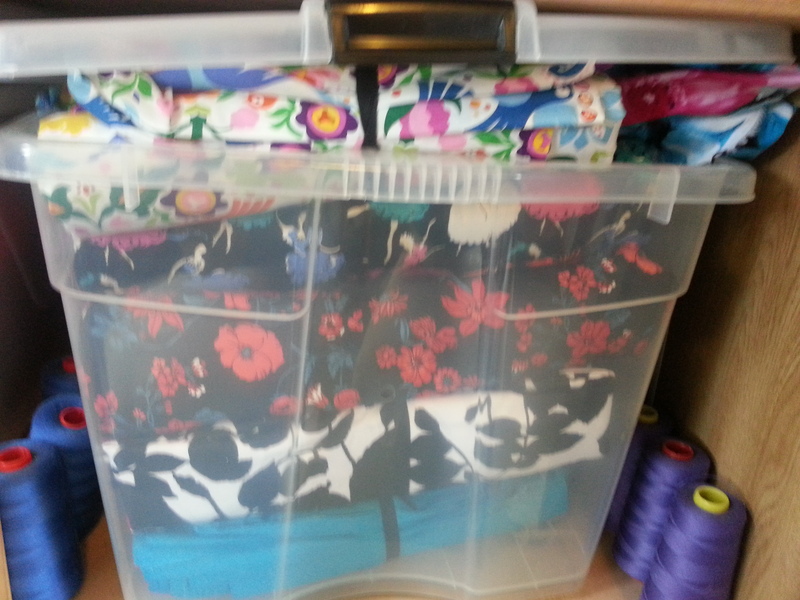 Under my massive table are smaller bins, filled with non fashion fabrics or speciality fabrics. This is where I’ll find felt, leather, vintage brocade, torn pantihose, old doilies or blankets, and all my scraps for crafting/repairs. On top live a series of shoeboxes that house my excessive pattern collection. I couldn’t get all of the patterns in in one shot, there’s a couple more shoe boxes out of frame to the right. The final corner. 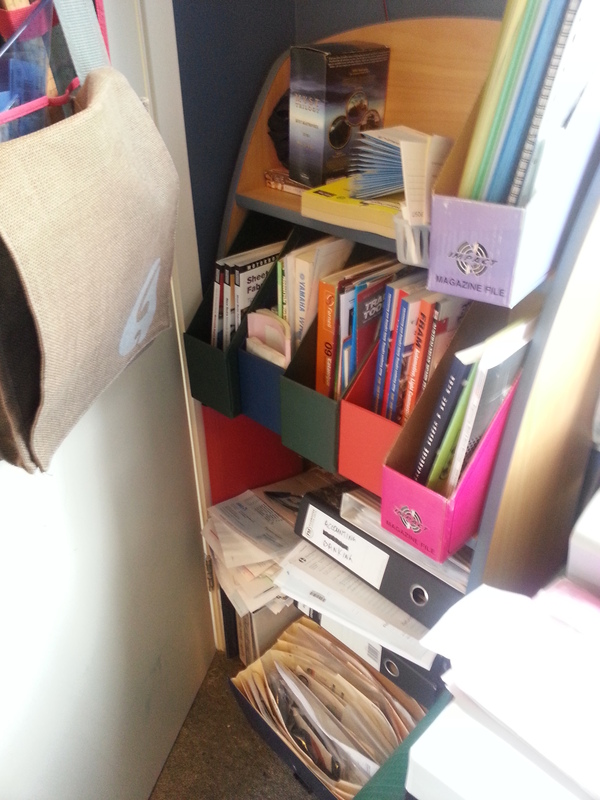 This bookshelf lives behind the door, right next to the desk, and is filled with household and business filing. 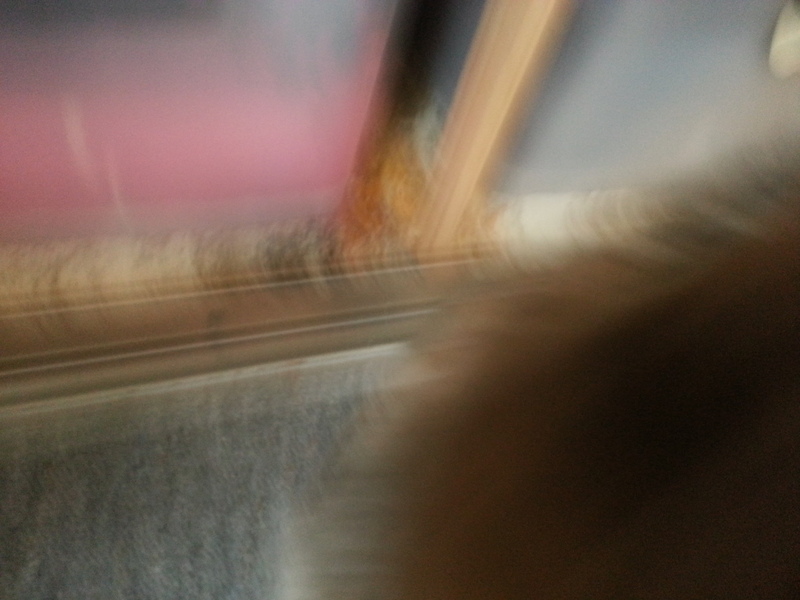 This is what happens when you attempt to take a photo just as your cat headbutts you for attention. 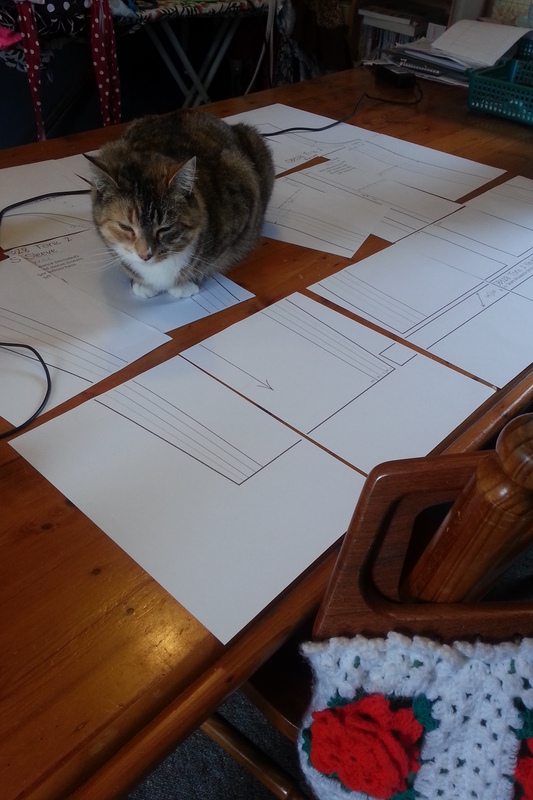 She does specialise in being helpful. I’ll be honest. 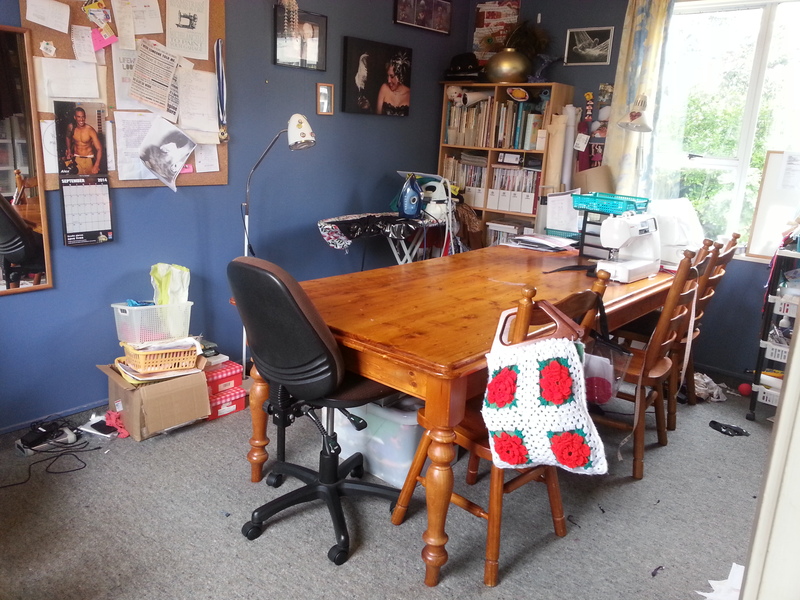 I would love for my sewing space to be tidy all the time. 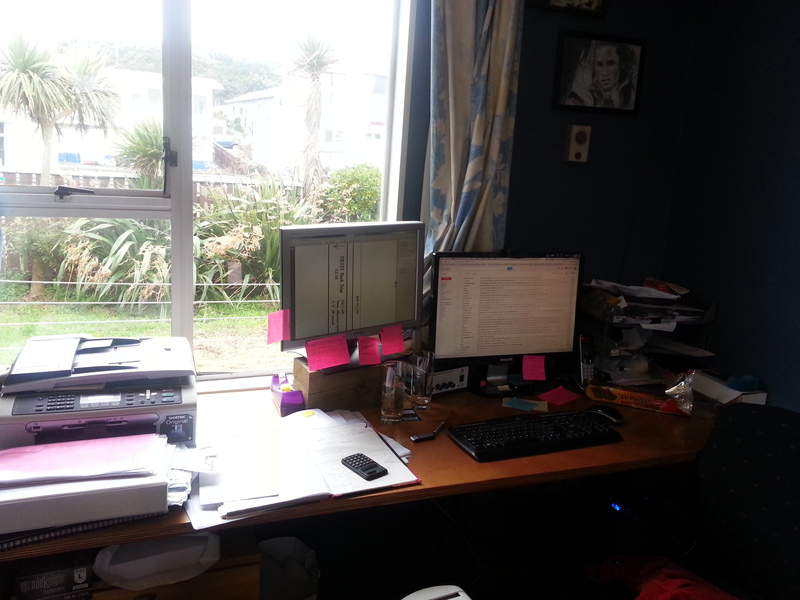 I feel more productive, more effective in a tidy space. And it’s not just the visible space. I like my stash to be neat and tidy, and my magazines to be in date order, and everything to be under control. What this means is that I spend more time tidying then some of my friends, some of whom are incredible productive in their sewing and crafting. 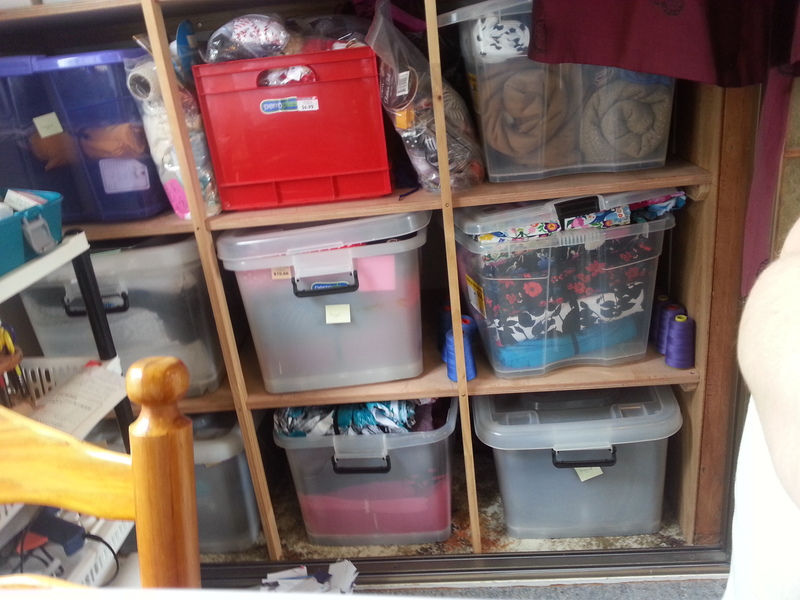 In fact, I have been teased for spending more time organising my stash then sewing with it! So I wonder, could I learn to craft in chaos? Could I spend less time tidying and more time making? Also, being the thinker that I am, I wonder what this relationship with mess means? I think about the article I linked to above, and I wonder, am I not creative because my space isn’t messy enough? As I frequently doubt whether or not I can all myself creative, I wonder should I learn to craft in chaos to somehow improve (or just prove) my creativity? But I doubt I could as my habits are so ingrained. 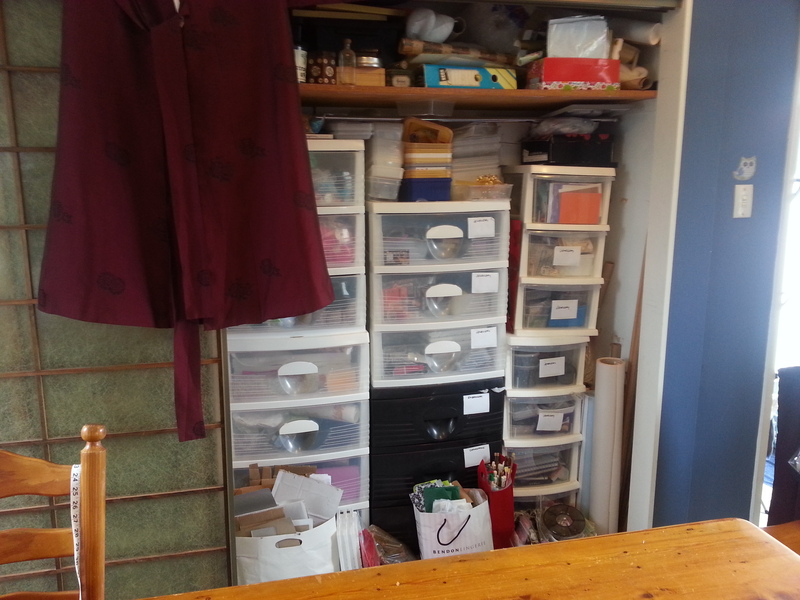 But at the other extreme, I do want to do more with my sewing room than just tidy it! I do want to embrace the creativity that comes with mess! So, I try to find a balance where I invest enough time in tidying that I can work in it, but not so much that it is all I do. And one day, when we no longer have a flatmate, I’ll relocate the home office and kipple pile to another room! But in the meantime, the tide comes and goes. But there is more than just chaos versus order to contend with when thinking about our relationship with our space! What about function? What about aesthetics? Gemma suggested we tell you a bit about our upcoming projects. I am currently head down on a complex lot of burlesque costuming. This pile of wet look foil printed knit is part of that! She also suggested we show of our favourite bits of stash. As I love all of my stash, and digging it out is hard work, I thought I’d show a random selection, so you get this pile that has most recently been prewashed. Yes, there is four lots of polka dot, so what? Aesthetically, there is SO much I want to do to this room. I want new coloured walls and new curtains and beautiful furniture everywhere. I’ll be honest, I (not so) secretly want a Pinterest-worthy space! I want natural light and bright colours and a moodboard and lots of art and probably even a mason jar or two, possibly with buttons in them. I want to walk in to my room and feel like I’m looking at a magazine spread! I want to feel the same rush of lust that I got when I saw Oona’s recent colourful sewing room tour (I like to think the WSBN tour inspired her post, haha!) But I’m limited in what I can achieve by cost and time and the sheer headache of unpacking my room long enough to repaint. Not to mention the lack of functional walls (with three of them largely dominated by windows or cupboards). So I’m doing a bit here and a bit there and one day when the home office is banished to the other spare bedroom and this space is solely mine it will achieve glorious perfection. Or is that aiming too high? In the meantime the lack of beauty is yet another reason why I work so hard to manage the debris that seems to accumulate, so that I have the beauty of open space, if not the true beauty of the room. The lack of aesthetic pleasure doesn’t affect my productivity in the same way as mess does, but I certainly feel more inspired and more creative when I look at pretty things. Thank goodness for blogs, right? Gemma also thought we should show you some shots of our location. 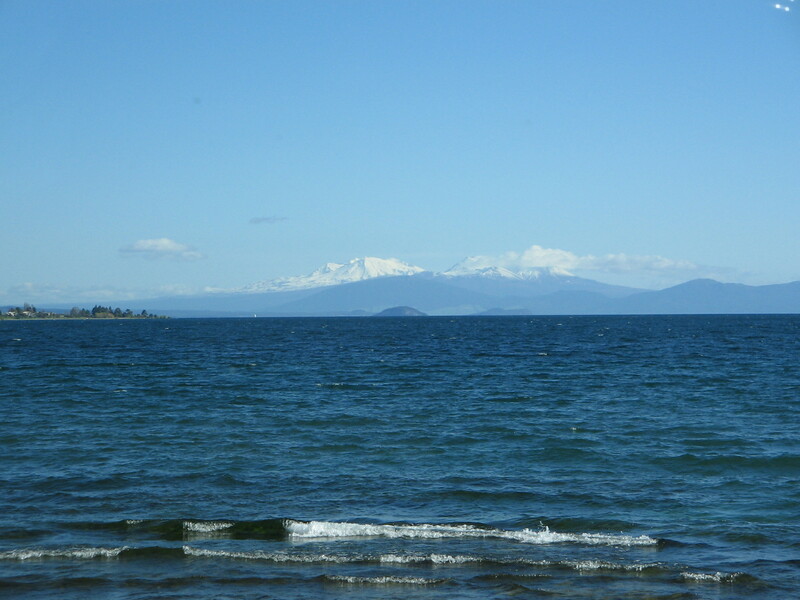 As the view out my sewing room windows is of our fence, here’s a shot of the Island Bay beach that is at the end of my street, less than 50 metres from here. 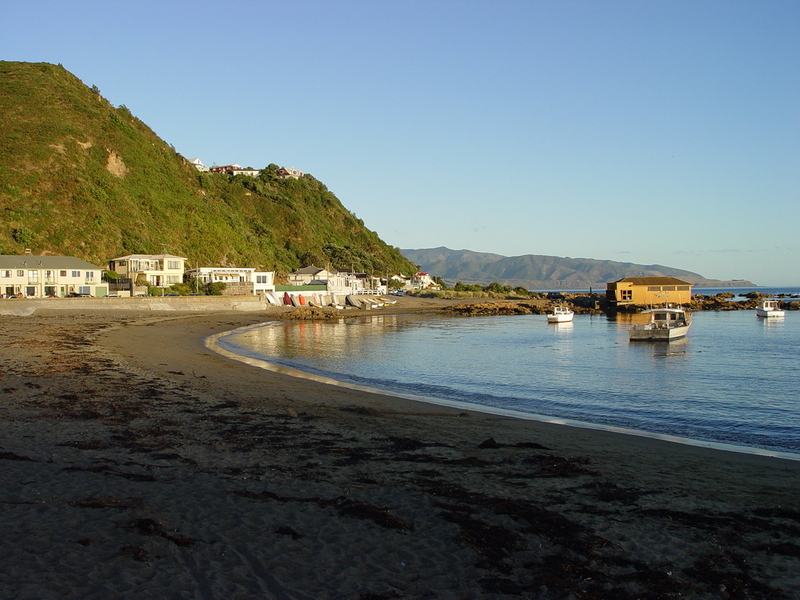 I love living on the South Coast of Wellington, and when you have views like this on walks along the beach, can you blame me? And a parting shot of Island Bay taken from a hill looking down. I didn’t take this, my aunt-in-law did, but it is too gorgeous not to include. Thanks for sticking it out this far, if you have in fact made it to the end! So tell me, what about your space, and your relationship with it, influences your creativity and productivity?